2012 and 2013 were both great years for cinema, but 2014, at least for me, had a lack of great cinema. Don’t get me wrong, there were plenty of films I loved (and I haven’t even seen such acclaimed pictures like A Most Violent Year or Nightcrawler), yet there weren’t too many movies this year that genuinely moved me. In his final leading role, Philip Seymour Hoffman plays a German espionage agent searching for the son of an Al-Qaeda operative. A Most Wanted Man‘s Hamburg setting reflects the iciness of the Cold War as well as the paranoia in a post 9/11 setting, and Corbijn’s direction creates one of the year’s most entertaining and clever pictures. A celebration of famed film critic Roger Ebert, Life Itself is a fantastic tribute to one of the medium’s best writers. Featuring a selection of Roger’s friends and colleagues, including Martin Scorsese, Jonathan Rosenbaum, Werner Herzog, and A. O. Scott, Life Itself delves into Roger’s life, providing a nostalgic and sentimental take on the critic that will certainly please his devoted readers such as myself. Though many joked about the logistics of the film’s complex ending, Interstellar was one of 2014’s most provocative and intelligent movies. Continuing both Nolan’s and Mathew McConaughey’s winning streaks, Interstellar mixes Spielbergian wonder with Kubrickian dread, and is thoroughly magnificent. After Anna, an up and coming nun in the convent, discovers her parents were Jewish, she embarks on a road trip with her aunt Wanda, leading to an identity crisis for both women. Ida has the feel of an Ingmar Bergman picture and its storyline certainly merits comparison to Wild Strawberries. The performances by the two leads are amazing, and with its stark black and white cinematography, Ida provides a poignant look on the crossroads of morality. By now, you’ve likely heard of Gone Girl‘s big twist. Fortunately, I walked into the movie without any knowledge of it, and Gillian Flynn’s screenplay caught me completely by surprise. Yet Gone Girl doesn’t simply rely on shock value and it is the year’s most solidly entertaining movie. David Fincher once again proves he is a master of the thriller genre, providing a chilling and brutally realistic scenario that will surely connect to anyone who has followed the trials of O. J. Simpson or Casey Anthony. A tale that mixes morbidity with dark humor, Force Majeure is like if Michael Haneke directed a movie with a Larry David script. After a husband abandons his wife and children during a staged avalanche, the spouses question their solidarity of their marriage as well as the future of their family. Östlund leads viewers to analyze the characters’ intent, leading to a fascinating case about the ethical guidance of manhood. In the screening I attended to see Paul Thomas Anderson’s latest film, about five or six people left their seats halfway through the picture. Three-fourths into the movie and several others walked out (and I was at a manatee showing). Inherent Vice may be the most decisive picture of 2014, but its a solid comedy that part Master part Boogie Nights. Anderson’s bleak and often absurd humorous take on Raymond Chandler-esque mysteries certainly evokes the Coen brothers’ The Big Lebowski (and not just because both movies’ protagonists are pot-smoking hippies) and through his surreal lens, Paul Thomas Anderson examines the cultural anxiety of an early 70s Los Angeles. While Inherent Vice won’t win him any new fans, it further demonstrates why PTA is the best director working today. Miller’s previous movies Capote and Moneyball were great pictures but with Foxcatcher the director moves to a whole new level of filmmaking. A chilling tale between a troubled millionaire and his wrestling prodigy, Foxcatcher is gripping throughout its two hour running time, not to mention that Steve Carrell’s dramatic turn as John duPont was one of the most enthralling performances of the year. No film in the past twelve months, or perhaps even this decade, has drawn as much critical praise as Boyhood. The result of twelve years of filming, Richard Linklater’s latest picture about the transition of growing up hit home for me, though I fortunately didn’t have divorced parents or financial troubles in my childhood. Echoing real-life experiences from switching schools to falling in and out of love, Boyhood is a thoroughly realistic and emotional piece of cinema that fulfills film’s ultimate purpose to duplicate life on screen. 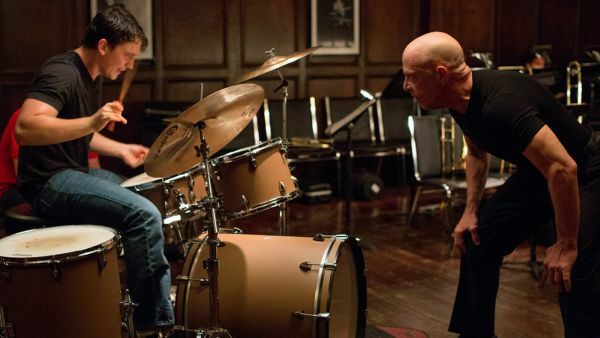 While Boyhood may be the most expansive film about adolescence, Whiplash is the best. The story between an aspiring jazz drummer and his abusive mentor, Whiplash is often funny and terrifyingly real, forcing viewers to question the lines of devotion. The highlight of the picture, of course, is J. K. Simmons’ performance, the strongest in the actor’s career, though Miles Teller’s role is equally as good as the dreamer student. It’s incredible that this is Damien Chazelle’s directorial debut, which had the sharpness of a veteran filmmaker. Whiplash may be made for jazz fans, but all moviegoers should see this. Nice list, and great to see Whiplash at 1. A 2015 film for me but one that I’ve enjoyed as much as anything else so far this year. Haven’t seen Life Itself or Force Majeure yet but I hope to soon. Thanks. Whiplash really stood out for me as 2014’s best, even more than Boyhood. I highly recommend checking out both Force Majeure or Life Itself. Great list. So agree with WHIPLASH. Thanks! Whiplash really grew on me after I first saw it, and while my initial draft had Boyhood at the top, I revised it to include Whiplash as my number one pick. Force Majeure–I’d like to see that. I saw it a couple of months ago on VOD. You should be able to watch it on Amazon Prime or iTunes. Yeah; awesome seeing Whiplash at the top of the pile. Can’t wait to see this again; I know it will be just as awesome! Thanks! Everything about Whiplash is perfect. I definitely will look forward to seeing it again. Cool list. I haven’t seen all of them but Whiplash and Boyhood would make my top 10. Boyhood was my favorite of the year. Thanks! Whiplash and Boyhood really stood out in 2014 for myself as well. I had a difficult time picking my number one pick but I leaned toward the former picture. I’m really looking forward to what Linklater does next. Terrific stuff dude. I have many of the same in my list. I have only just now seen Force Majeure, but I was blown away by the conversations that film has and will generate after a viewing of it. I wish I had seen Interstellar again in cinemas; it just won’t be the same on DVD! Haha. Thanks man. Force Majeure was a hell of a movie. In fact, there’s a remake in the making right now with Julia Louis-Dreyfus connected to the project. Aw man, that’s kinda lame. ^ Oh man, that is perfect. Love seeing Whiplash at #1! Thanks man. Now that there’s going to be a remake with Julia Louis-Dreyfus, the Larry David-ism of Force Majeure can’t be ignored. And Whiplash was a great film for sure. Thanks! Both Ida and Life Itself are available on Netflix. Completely agree about Whiplash being #1. With Inherent Vice, that was also my experience at the theater; we were left with about half of the people who started out, and there weren’t many people there to begin with. Other movies I’ll throw into the discussion: Enemy, Only Lovers Left Alive, Blue Ruin, Snowpiercer, The Immigrant, Two Days, One Night, The Babadook, Birdman, etc. Yeah, I was surprised of how many people left the theater during Inherent Vice. It’s certainly not a movie for everyone, but so many of the audience members left through the screening. I was considering The Immigrant for an honorable mention. I really liked the feel to it but some parts were a bit too sluggish for my tastes. I agree, 2013 was a worthy year for Hollywood, and I personally like “12 Years a Slave”, Chiwetel’s performance was just awesome. There were also some good movies released in 2014 but not that much if comparing to its previous year. I can say that it was a one time watch period. Your list looks fair but I think “Boyhood” should be on top if not judging with it IMDB rating. Its Screenplay is really appreciative, and the film engage audience a lot.